Myss Lafunky's Blog: Are You A Chronic Grumbler? How is your new week going? Can you believe it's less than 5 weeks before it's Year 2015? I want you to take this opportunity to thank God for all He has done for you and your family. You might still be waiting for the manifestation of some of your prayers, nonetheless, still thank God for the gift of life and for all. As you are aware, God is currently teaching and pruning me about James 5:9 - Do not grumble against one another, brothers and sisters, or you will be judged. I haven't been doing too bad actually. I am speaking less, I consciously change the subject, I am also bold to state that 'I don't want to talk about that issue as it would not glorify God'. I recognise that grumbling against others and condemning others is so appealing and this sin is affecting Christians, a lot of us focus only on sexual immoralities as the only sin and we forget about the rest. After God miraculously rescued the Israelites out of slavery in Egypt and they were free in the wilderness, they started grumbling about everything- the lack of food and water. They didn't like Moses as their leader. They grumbled against the Lord, not Moses (Exodus 16:6-8). Do you know what God did to them? God declared that the adults who left Egypt would not even set foot in the promised land because of their rebellious grumbling (Numbers 14:26-32). 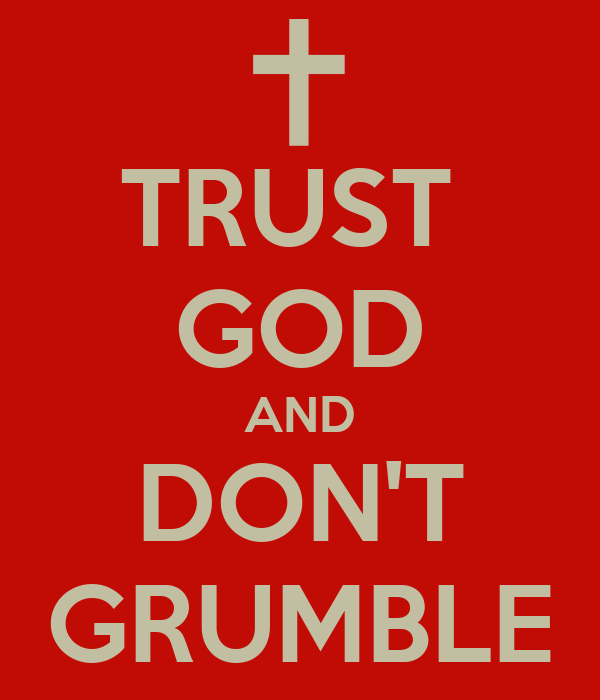 This shows us that, God is against grumbling, it can harden our hearts toward God. Finally, ask yourself, who do I grumble against and why? How can I not grumble against them? Have I asked God to help me?